If you don't have rotisserie chicken on hand, try boiling two breasts and shredding them with a fork. Don't eat meat but still want to give this sandwich wrap a try, don't worry! Try swapping out the sandwich with tempeh, grilled tofu, or broiled cauliflower. If you don't have time to make the sesame peanut dressing by hand, simply buy the packaged variety from the store, taste it, and doctor it up with fresh lime juice, coconut milk, or sweet chili sauce. Whisk together salted chunky peanut butter, sweet chili sauce, coconut milk, soy sauce, sesame oil, rice wine vinegar, Sriracha and cilantro in a bowl. Add the pulled rotisserie chicken and stir until incorporated. Cover and set aside. Begin by warming the whole grain wrap in the oven or in a pan over low heat. 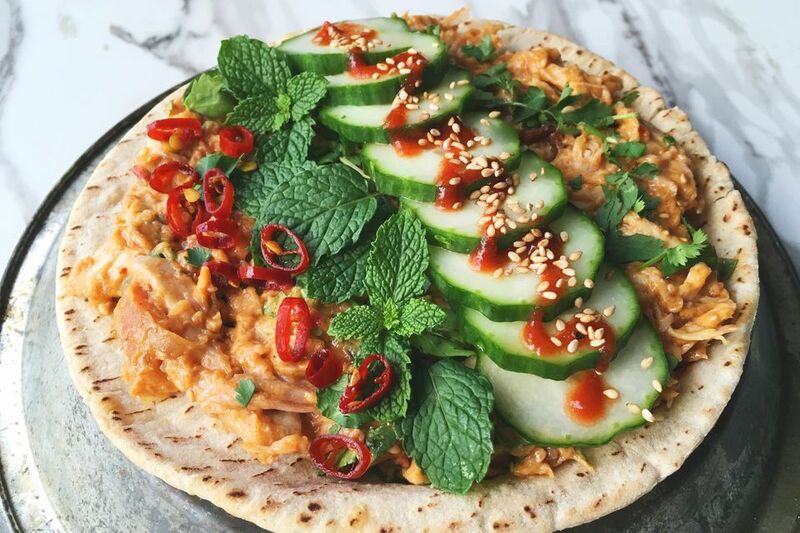 Smear on the spicy Thai chicken salad (more or less depending on the size of your wrap) and top with cucumber, mint, chopped cilantro, chilis, Sriracha and toasted sesame seeds. Roll wrap before eating or fold in half and enjoy like a taco. This sandwich can be made up to 4 hours in advance otherwise the cucumbers get soggy and the wrap gets mushy.